A new international analysis of marine fossils shows that warming of the polar oceans during the Eocene, a greenhouse period that provides a glimpse of Earth's potential future climate, was greater than previously thought. By studying the chemical composition of fossilized foraminifera, tiny single-celled animals that lived in shallow tropical waters, a team of researchers generated precise estimates of tropical sea surface temperatures and seawater chemistry during the Eocene Epoch, 56-34 million years ago. Using these data, researchers fine-tuned estimates from previous foram studies that captured polar conditions to show tropical oceans warmed substantially in the Eocene, but not as much as polar oceans. Importantly, when modern climate models - the same as those used in the United Nations' recent Intergovernmental Panel on Climate Change reports - were run under Eocene conditions, many could not replicate these findings. Instead, the models consistently underestimated polar ocean warming in the Eocene. This discrepancy may result from a gap in our understanding of the climate system or from what we know about the Eocene, said David Evans, the study's lead author and Leverhulme Research Fellow at the University of St Andrews' School of Earth and Environmental Sciences. If it does indeed relate to the climate system, it raises the possibility that predictions of future polar warming are also too low. "Yes, the tropics are warming but nowhere near to the same degree as the polar regions," Evans said. "That's something we really need to be able to understand and replicate in climate models. The fact that many models are unable to do that at the moment is worrying." The researchers published their findings this week in the Proceedings of the National Academy of Sciences. Scientists frequently look to the Eocene to understand how the Earth responds to higher levels of carbon dioxide. During the Eocene, the concentration of carbon dioxide in the atmosphere was more than 560 parts per million, at least twice preindustrial levels, and the epoch kicked off with a global average temperature more than 8 degrees Celsius - about 14 degrees Fahrenheit - warmer than today, gradually cooling over the next 22 million years. These characteristics make the Eocene a good period on which to test our understanding of the climate system, said Laura Cotton, study co-author and curator of micropaleontology at the Florida Museum of Natural History. One of the challenges has been accurately determining the difference between sea surface temperatures at the poles and the equator during the Eocene, with models predicting greater differences than data suggested. The research team used large bottom-dwelling forams as "paleothermometers" to gain a more precise temperature reading. 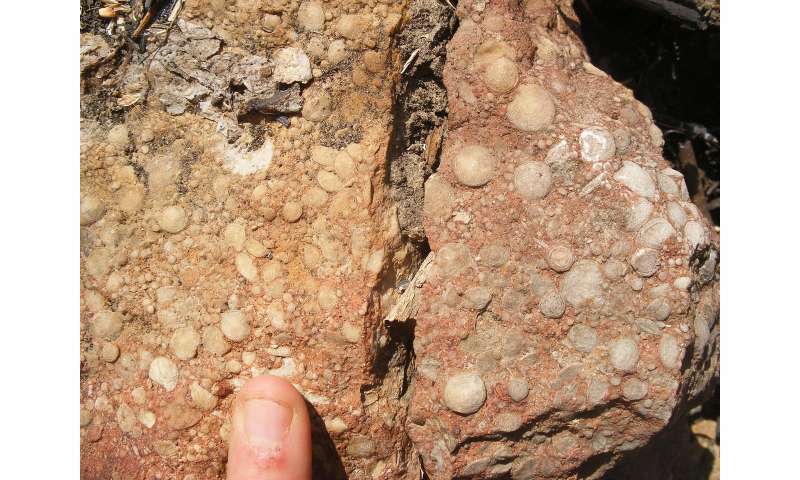 Forams have an exceptionally long fossil record, spanning more than 540 million years, and they are often well-preserved in ocean sediments. Most are small enough to fit into the eye of a needle - Cotton describes them as "an amoeba with a shell" - but they were so abundant during the Eocene that there are entire rocks composed of them. "If you look at the pyramids, they're full of these tiny little lentil-like things - those are forams," Cotton said. "The ancient Greeks thought the pyramids were made from the fossilized lentils of slaves, but it's just the limestone from one of these deposits that is absolutely filled with them." 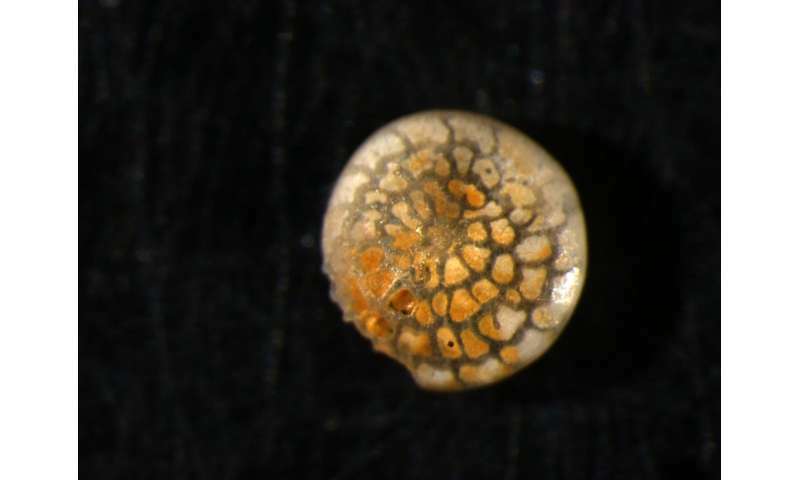 Forams form their shells in concert with ocean temperatures and chemistry, acting as miniscule time capsules, each containing a precise record of the temperature and ocean chemistry during its lifetime. Their shells are primarily made of calcium, carbon and oxygen. Heavy isotopes of carbon and oxygen bond together as a foram makes its shell - the cooler the temperature, the more they bond to each other. By analyzing these clumped isotopes from fossil specimens found in India, Indonesia and Tanzania, the researchers could get an accurate reading of sea surface temperature across the tropics in the Eocene. They also lasered a small hole in each specimen to measure the amount of magnesium and calcium that vaporized, revealing the seawater chemistry. They found that tropical sea surface temperature in the Eocene was about 6 degrees Celsius - about 10 degrees Fahrenheit - warmer than today. "This was the first time we had samples that were good enough and this method was well-known enough that it could all come together," Cotton said. The team then used their dataset from the tropics to back-calculate the temperature and chemistry of polar oceans, relying on previous studies of forams that captured the conditions of those regions. With this correction factor in place, they investigated the degree to which polar oceans warmed more than the tropics, a feature of the climate system known as polar amplification. Their data showed that the difference between polar and equatorial sea surface temperatures in the Eocene was an estimated 20 degrees Celsius, about 36 degrees Fahrenheit. Today the difference is 28 degrees Celsius, indicating that polar regions are more sensitive to increases in atmospheric carbon dioxide than the tropics. Troublingly, said Evans, when the team compared their data with various modern climate models under Eocene conditions, most models underestimated polar amplification by about 50 percent. The two models that came closest to reproducing the team's data had one key aspect in common - they modified the way they accounted for cloud formation and the longevity of clouds in the atmosphere, particularly in the polar regions. "To us, that looks like a promising research direction," he said. "If - and it's a big if - that turns out to be the right avenue to go down, that could play into the models we use for our future climate predictions." Because of the Milankovitch cycles, the tilt of the Earth would have been for most of the Eocene period slightly different from what it is now. Also, I assume sea levels for most of the Eocene period slightly different from what it is now. There may be several other conditions slightly different in most of the Eocene period from the present. All those differences would directly/indirectly effect global climate in complex ways and how efficiently heat is transported from the equator to the poles. So why cannot THAT be the explanation of why our current climate models for the current global climate don't work perfectly for the Eocene period? In other words, there could be not much wrong with our current models and they may accurately predict the near-future and the reason why they don't work well for the Eocene period may be merely because the way climate worked back then was a bit different thus our current models simply don't apply to the Eocene period. @humy - of course all those factors could be true, but would they account for such a large difference in expected/measured results? Maybe. But just assuming that to be true without further analysis would be shoddy science. Ocean currents would have been different, as N. & S. America were not joined. That happened ~2 Ma, from memory. India was still an island, and the Himalayas didn't exist. Very different scenario. I'm sure they would have known that. 8 degC hotter than now, but life was still thriving, while we are told that >2degC and we risk extinction? https://www.thegu...research that just before 100 millions years the Antarctica was covered by tropical forest - without any antropogenic emissions. And the terrestrial life not only survived it - it flourished and even came into bloom these times..
Everyone also knows that no ecosystem on Earth can adapt to a warming RATE like https://www.youtu...youtu.be without massive extinction level events. https://www.thegu...ears-wwf so we're off to a good start. Enjoy the upcoming dystopia my simple friend. Sure the vegetation will flourish, because most of us world-killing parasites will be (deservedly) dead. "8 degC hotter than now, but life was still thriving, while we are told that >2degC and we risk extinction?" How many Humans were "thriving" back then in those conditions? The Eocene climate was driven by a circum-polar oceanic current. The CO2 levels were not primary drivers and possibly resulted from the current rather than drove it. If you look at the geographical arrangements of the time, you can see that the Pacific has a direct opening at the poles for equatorial currents to penetrate. These currents transferred heat to the poles that is otherwise covected at lower latitudes now. A commenter below made similar remarks and fine points. Are our scientist really this dumb? ....or are scientists really doing a disservice by allowing non-scientist people to own and misrepresent their findings? Really? All scientists rely on non-scientist controlled assets to do work. Hey, I got an idea! A little experiment just for the benefit of the paid shills of climate change deniers. You all stand right over there where a naturally occurring avalanche will come slip-sliding down on you. Huh, you survived the habitual rock-fall. Good for you! Now I'm going to steer this skiploader of rocks over to where I hear you groaning. And dump it on you for fun and profit. Cause it's the capitalist way. That no situation, no natural cataclysm is so great that we will not pass up any profitable opportunity to make it worse. For yourself and everybody else. In the distant future. You will be a prime exhibit in a museum. For the edification and education of the giant cockroach schoolkids visiting. I'm sure they will be very impressed with your mounted fossilized corpse. Impressed by how determinedly you still clutch onto your money, even in death. The supreme example of the old adage "How do you trap a monkey?" This is a pathetic desperation article. With the cold inundating north America and northern Europe. Global temperatures are likely to decline. They will be passing out the razor blades and buckets. They are trying to care the weak and craven in to believing that its not over and warming is still occurring when evidence is clearly to the contrary. The rest of the world would like for Americans to pull their heads out of their collective two-percent-of-the-world's-surface asses please. A cold Arctic was the only thing keeping your climate temperate and you melted it. You know that so STFU about it. The rest of the world, in a heatwave, wants you to stop being so narcissistic. Thxs. This is a pathetic desperation article. With the cold inundating north America and northern Europe. Global temperatures are likely to decline. ..They are trying to care the weak and craven in to believing that its not over and warming is still occurring when evidence is clearly to the contrary. No Georgie Porgie the fact here today is that YOU being an antigoracle sockpuppet is beyond pathetic in your babblings, what you babble here, everyday is exactly what big filthy oil is has been using to try and dumb down unsuspecting citizens all for their greedy causes, damaging earth for DECADES. Suffice to say, the tide has turned the past few years however, and people like myself and others knowing and pointing out the truth have been making the world aware of your and the like's utter stupidity, and more people is catching on everyday as you thump that chest to let everyone know you are the loudest illiterate monkey in town. No, idiot. And I don't know of anyone that claims this. A >2degC would probably have a harmful effect on human civilization because of sea level rise and more hurricanes etc. I read the paper, and it certainly appears that they used a model that uses Eocene geography. OK; to my relief, I was wrong about that. Glad they are using their full intelligence.